Got those southern and strong cocktails all perfected? Good! Because it's time to head north, where we're gonna' get all classy. Today's lesson focuses on a straight up, crisp cocktail which has become a classic in Maine. When you think of Maine you think of lobster. But what about the perfect thing to go along with your seafood feast? (Butter doesn’t count.) The most obvious cocktail choices would be a gin and tonic or a martini, but really, a Gibson is the way to go. With its base of gin, a form of alcohol made from juniper, it's the perfect complement to seafood — especially lobster. Though the origin of the Gibson is muddled, the most popular rumor sources its creation in the New York City bar the Players back in the 1960s, when artist Charles Dana Gibson asked for something better than a martini. (There’s also another story from a different New Yorker named Gibson, stockbroker Walter Campbell Gibson, who was rumored to have ordered this drink at the Knick bar.) Either way, this drink's invention was a godsend to the multitude of seafood restaurants in New England, which needed something to pair with their freshly-caught lobster. Yes, the Gibson is basically a regular martini with an onion instead of an olive, but hear us out — the onion makes the martini. It adds something savory, which is perfect for fighting the frigid cold in America’s northernmost continental state. (Ever heard the old tale that eating onions can cure a cold?) Any cocktail that cures your ailments instead of causing them is a star in our book. 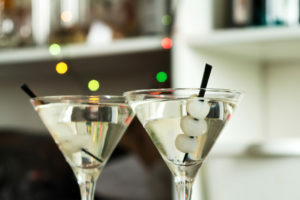 Ingredients 2 oz gin 1/3 oz dry vermouth Silverskin onion Directions Stir the gin and vermouth in a shaker with ice, then strain into a chilled martini glass. Garnish with onion. For a spicier take on this martini, try a Black Pepper Gibson. Ingredients 4 oz vodka Dry vermouth Cocktail onions Black pepper Directions Rinse martini glass with vermouth. Fill a mixing glass with ice and add vodka. Stir and strain into martini glass. Garnish with onion and pepper.